In less than 4 weeks, the conf.KDE.in event starts in Gandhinagar, India. And looking at the list of talks, it is shaping up to be an awesome event. It has shown to be a great way of helping students get involved in KDE and Free Software, combining a friendly atmosphere with a wide variety of talks. I have to confess that I barely, if ever, manage to listen to talks at events. I usually am too busy talking to all the cool folks around - I have managed to almost miss my own talks a few times, showing up last-minute. But conf.KDE.in might turn out different. I just had a look at the list of accepted sessions and while they promised more are coming, this is already more than enough to make me promise myself to attend as many as I can. Just a taste below. There is a number of talks around getting involved in Free Software (and KDE in particular). These are very much worth joining - I've already seen that Smit Shah got involved at this every event last year and now is featured as speaker. What he means by coconut I'd love to hear, too. There are more speakers about this subject, like Rishab Arora about hacking on KStars and so on. Inspiring. A second series of talks is about KDE and related technologies. It introduces you to Plasma Next (Bhushan Shah), the Mer Project (by Siteshwar Vashisht and Shantanu Tushar), Frederik Gladhorn (from Digia) will give an overview of the Qt Project, Peter Grasch himself will introduce Simon and speech recognition integration and so on. And myself, I'll give a pretty darn broad talk about where KDE is and where it is going, touching on both technical and social subjects. Yeah, a few comma's and dot's got lost on that page, I promise I'll talk in simple words and use punctuation during the session. It isn't certain yet but I might be giving a few more practical workshop-style sessions (with a very low barrier to entry) about subjects like building local communities, giving presentations and social skills in Open Source projects. I guess it'll depend on demand and availability of rooms if those will happen or not. Some talks are technical - low-level stuff like programming languages and tips. Doesn't need to be terribly hard to understand, however. For example, Kevin Ottens will talk about C++11, calling it a language renaissance. Now that's a ambitious title but he's been explaining me a few of the C++11 features and it seems impressive. Let me point out here that I'm a psychologist and while my wife has remarked that I'm "pretty smart for a psychologist" I know no more than the very basics of programming, not having touched anything more complicated than a bash script for, well, ever. So while the talk page notes 'Intermediate' as Difficulty level, I would say that any proper nerd will enjoy it. With proper nerd here meaning somebody with the right attitude, irrespective of knowledge or experience. See some more talks here. I will of course be there also as openSUSE guy. I'll try and bring a few DVD's and some other stuff, if I can. I just blogged about my article on linux.com about the just-released KDE Frameworks 5 sneak preview. I would argue that neither Apple, Microsoft, GNOME, nor Ubuntu/Canonical are even half as ambitious as the KDE Community in the area of convergence. They are all merely catching up to the state of KDE technology in 2010. In that year, the KDE community released Plasma Netbook, a plasma-based shell optimized for another form factor: the netbook. With far more advanced convergence than anybody today has yet shown: Plasma Netbook and Plasma Desktop share well over 90% of their code, as opposed to not even sharing toolkit or display shell (Ubuntu) and having a completely separate desktop (Apple). On Plasma, widgets can dynamically adjust to the constraints of their environment, be it on a panel, free-form on the desktop, full-screen, in a window or in a tiled environment. And yes, the different form-factor optimized shells be switched on-the-fly. No separate login or account, no loss of functionality, no separate applications for each shell, nothing like that. It just works. See this blog from 2011 to get an idea how the tablet plans were doing. 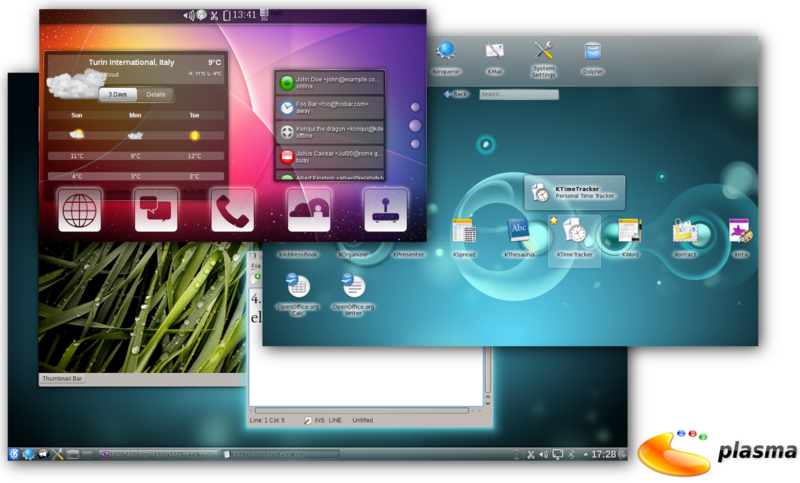 Plasma on desktop/netbook/phone in 2011. Instead, the Plasma team has build a technology which separates presentation from logic, allowing you to build UI's which adapt dynamically to the needs of the form factor. Below is a video of Plasma's awareness of the container size in action, like it has functioned since it was released in 2008. All this technology will be brought to a new level with the release of Plasma 5, where your workspace will be able to smoothly morph into a different form factor without even a hickup. So, when it comes to the convergence of formfactors, KDE is lightyears ahead of what the competition is even aiming for. And outside of that, we're doing awesome stuff, for sure. Did I say something about the power of innovating in the open? That's what I'm talking about. Today, the KDE Community has released KDE Frameworks 5. I've written a guest blog on linux.com about why I think that that matters for Free Software. In short, I argue that the most used Free Software toolkit stands to benefit tremendously from the knowledge, experience and code of the dominant Free Software desktop project. The value of a community like KDE can hardly be overstated. The open and inspiring place it provides naturally is something companies spend billions to build (and usually fail). The KDE community has already contributed a lot to Qt and with Frameworks 5 this stands to continue at a fast pace. A complete, mature and openly developed toolkit on and for open source platforms is important for Free and Open Source, for current hardware configurations, the new generation of mobile devices and other consumer electronics. KDE Frameworks is an important contribution to innovative and compelling open platforms. And Free Software won't have to wait long. As Sebastian Kügler noted, most of the work is done. Two modules, KArchive and Threadweaver are already good to go and as Mirko Boehm blogged, these are very mature and usable already. He noted that no API breaks are coming for Threadweaver and as far as I know the same is true for KArchive, making these two ready for use right now. This allows developers to save development and maintenance work. You can be assured that this code is mature, tested and build based on real-world needs, developed in an open governance process and following clear code- and API style guidelines. Of course, openSUSE offers binaries for openSUSE 12.3, 13.1 and Factory.